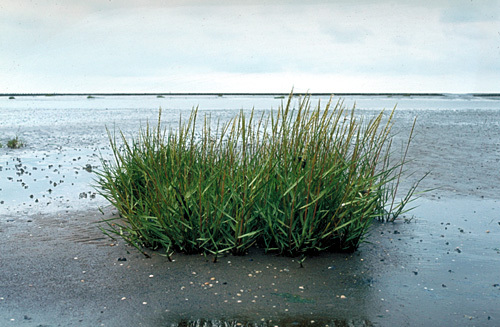 The plants in the salt marshes are adapted to live in the high concentration of salt in the sea water and the very changing conditions due to the tide. The first plant to establish on the newly deposited mud flats is Salicornia europaea. In the 1930'ies the grass Spartina anglica (picture at right) was introduced and planted and is now a competitor to Salicornia. Both species are important in withholding clay material through their root systems and there by stabilizing the muddy ground. This gives the opportunity for a new grass Puccinellia maritima to establish and spread its long stolons over the mud flats to create a vegetation blanket. Other important plant species in the outer salt marsh are Suaeda maritima, Spergularia maritima, Aster tripolium, Triglochin maritima and Plantago maritima. In the inner salt marsh where some of the salt has been washed out by rain lies salt meadows with species as Juncus gerardi, Festuca rubra and others. 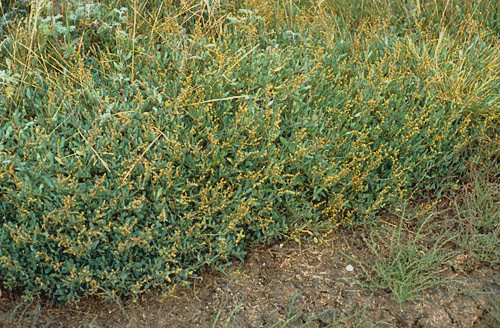 Halimione portulacoides is common in the salt marshes in The Wadden Sea, but is only found a few other places in Denmark. It may be under spreading in Denmark as it has been found at several other places in the recent years. Back to The Wadden Sea.